What Does The Fake Hailie Mathers Twitter Story Mean For Journalism At Aol? So, AOL’s pop culture/gossip blog, Popeater, laid a ton of employees off last week. I’m not sure how many, exactly, but at least four of their résumés have landed on my desk in the last week, if that tells you anything. This culling of the AOL’s editorial staff is nothing new, of course. CEO Tim Armstrong is a big believer in the neighborhood watch-esque, “hyperlocal” amateur journalism outpost Patch, he bought the Huffington Link Dump Factory for $315 million and killed AOL’s Fanhouse in the first quarter of this year ALONE. 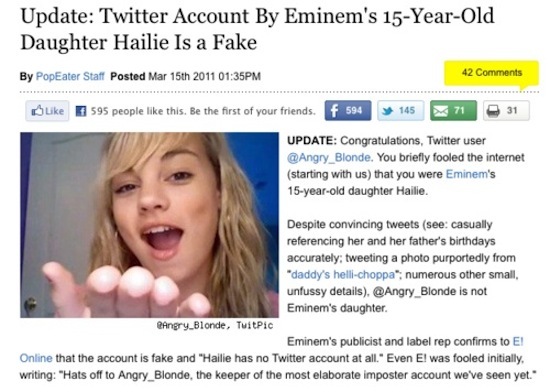 So when Popeater scored themselves a big scoop yesterday by revealing that Eminem’s daughter Hailee was secretly Twittering, I thought to myself, “Good for them! Layoffs are tough, but at least they kept their core reporting team in place.” As with any story that AOL points their traffic firehose at, this scoop traveled all over the internet, and I have zero doubt that literally millions of people read that story (or, at least, read the headline). Well, it turns out today that it was all a big hoax. Popeater/AOL didn’t do their homework by following through on a tip and actually reporting the story out; rather, they took a tipster at their word (ALWAYS a good idea! ), hit “Pub” and put their publicity/syndication wheels in motion. It wasn’t until other outlets (a rare pat on the back for E!) actually did some reporting and found out the account was a fake that Popeater issued a lighthearted, “Ha ha, fooled us!” retraction. Why does this matter? Of course, it doesn’t “matter” in the slightest that Eminem’s daughter isn’t really on Twitter. However, what does matter is that AOL has positioned themselves as a news outlet and have spent a ton of money/resources convincing web surfers their network of sites are something that people should trust in to get breaking news. And by steadily eliminating seasoned, professional writers (be they “reporters,” “bloggers” or whathaveyou) from their payrolls, the likelihood of these errors cropping up will no doubt increase, compromising their trustworthiness and reliability. Even scarier, though, is that the next time something like this happens underneath the AOL umbrella, it probably won’t be a harmless gossip story about some tween’s non-existent Twitter feed. There’s a very real possibility that the screw-up in question will be related to something that actually matters. Mark Graham is a Sr. Editor at VH1 and, after this incident, is not even sure how “real” the Real Slim Shady is. You can follow him on Twitter (@unclegrambo) or on his Tumblr, whatevs.tumblr.com.